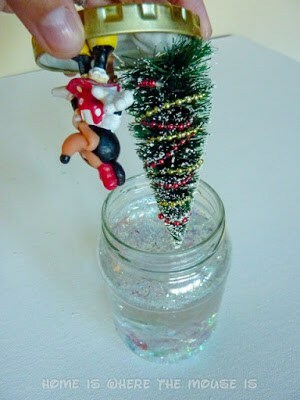 Bring the magic of Walt Disney World during the holidays home by making a Do it Yourself Disney Snow Globe. Christmastime at Walt Disney World is such a magical time of year. From Mickey’s Very Merry Christmas Party to snow on Main Street to the beautifully decorated gingerbread houses, Disney goes out of their way to make this a special time for their guests. 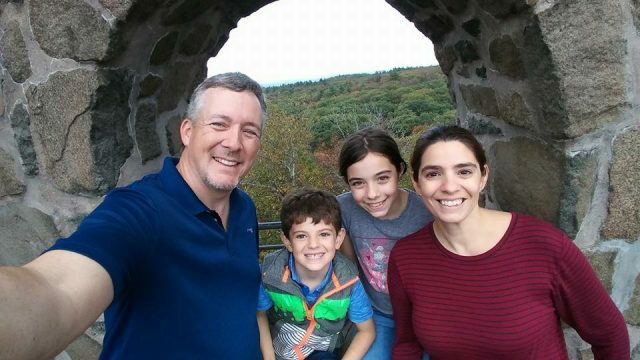 It’s too bad that it’s not possible to bottle all that joy and merriment to enjoy back home. This DIY craft project comes close. 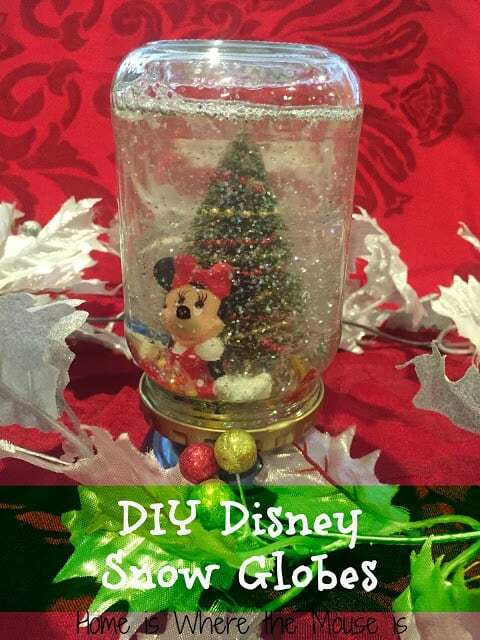 You can capture your favorite Disney Christmastime memory by creating a DIY Disney Snow Globe. 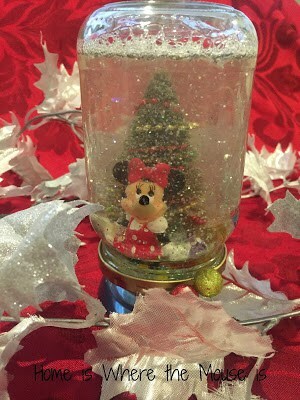 For less than you’ll pay for an authentic Disney Parks snow globe, you can make a unique project that will help you relive your precious holiday memories at home. *Tip: Make sure the items you use in the jar are waterproof. It is recommended that you soak them in water overnight to test. Some items dye may come off and end up turning your snow globe a different color. Clean and dry a glass jar with a tight fitting lid, removing the label. I used a pickle jar. Set aside. 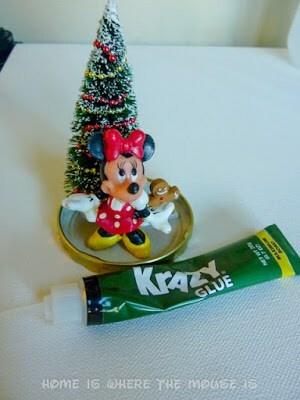 Glue your holiday scene and character to the bottom of the jar using the Epoxy or Super Crazy Glue. In the holiday section of my local craft store I was able to find miniature holiday decorations. One of my favorite things to do at Walt Disney World for the holidays is to visit the gingerbread houses at the resorts. 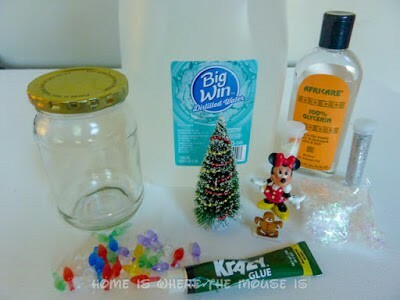 For my snow globe I used a bottle brush tree, gingerbread house, gingerbread man and miniature lights. Allow the lid to dry for 24 hours. 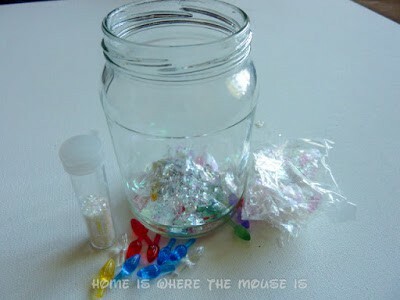 Cover the bottom of the jar with glitter/snow. I also added some mini Christmas lights to use as confetti. Add the distilled water, but don’t fill to the top. You need to leave a little room for displacement. Add 4 teaspoons of glycerin and stir. Turn your lid with the attached decor upside down and submerge it into the water mixture. Tighten the lid securely to close. Add a line of hot glue around the lid to seal. Shake the jar and watch the snowflakes fall. In no time you’ll be reminiscing about your favorite Walt Disney World holiday memories.